Just because you are on the go doesn't mean that you can't eat a healthy snack. There are many options that will fill your stomach while protecting your mouth. While some of them might take a bit of preparation beforehand, your teeth will thank you for it later. The next time you've got a road trip ahead of you, consider cutting up some celery or carrots ahead of time. These crunchy vegetables increase saliva in your mouth, which reduces cavity risk. The fibers act like a toothbrush to scrape away food. Plus, they are high in vitamin A, which helps to keep the teeth and gums healthy. Almonds are an excellent snack for oral health. These nuts are a good source of protein and calcium, and they are relatively low in sugar. There's nothing more convenient than grabbing an apple on the go. While apples are sweet, you don't have to avoid them to keep your teeth healthy. This succulent fruit is high in both water and fiber. Eating an apple will stimulate saliva production, rinsing away excess food particles and bacteria. Plus, the texture of the apple will stimulate the gums, reducing your risk for periodontal disease. Packaged in a convenient to-go cup, yogurt is a great travel snack. It is high in protein and calcium, which will strengthen your teeth. 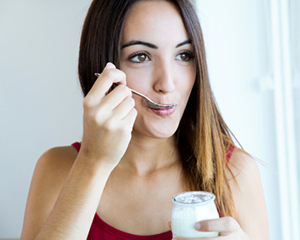 Yogurt is also high in probiotics, which benefit the gums by crowding out cavity-causing bacteria. While there are many flavors available, the best options for optimal oral health will be those without added sugar. Don't let your snacking habits become the cause of damage to your teeth and gums. Stick to foods that will keep your teeth healthy. These delicious options will leave you full with a smile that you can be proud to show the world.